It’s not often that I make a Chocolate Dessert for my husband. He really doesn’t care for Chocolate! In my mind, Valentines Day is not Valentines Day without a little Chocolate. This light airy creamy dessert is one that he actually enjoys. This is the perfect treat after a big meal, because it’s not heavy . . . it just fills in the cracks! If you haven’t made Mousse before, you really should try it soon. You can also take an ice cream scoop, and make mousse balls, then freeze them. It tastes like a super creamy ice cream. To top off the Mousse, instead of just plain Whipped Cream, I like to make this wonderful fruit dip. It’s actually what I use for Cream Puffs and Eclairs. It’s a perfect dip to serve with a fruit tray as well. I layer a bit on the bottom of my dish, and also put a dallop on the top. We also like to layer the berries throughout, and toss in some carmelized almonds. Sooooooo Delicious! with 1/4 cup water and 2 TBSP Butter. *You can use Milk or Semi Sweet, depending on how dark you like your chocolate. I used a large Symphony Bar. Once it’s melted, let cool for ten minutes. Now let’s combine the egg yolks, water and sugar. Whisk . . . Whisk. It will be the consistency of a thin custard. It only takes four to five minutes. Whisk this mixture into the melted cooled Chocolate mixture. Set this Chocolate mixture in a bowl of ice. Stir it occasionally . . . you want it nice and cool. Don’t worry about the calories. You can run later. . .
Now very gently – fold all that Whipped Cream into the Chocolate. Mine is a Milk Chocolate Mousse. You can make yours much darker, by using Dark Chocolate. My hubbie wouldn’t touch it . . . if I did that. Cover and place that bowl in the fridge for about 30 minutes. Prepare this wonderful Cream Puff Dip! It’s yummy, and very quick and easy. This is a fantastic dip for fruit. Use as the filling for Cream Puffs and Eclairs. Put some of that Cream on the bottom and a dallop on the top. Raspberries or strawberries make it even better. I use an large 8 ounce Symphony Bar. 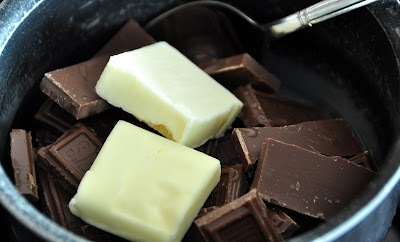 In a microwave or double boiler, heat chocolate, 1/4 cup water and butter until all is melted. Cool this mixture for 10 minutes. 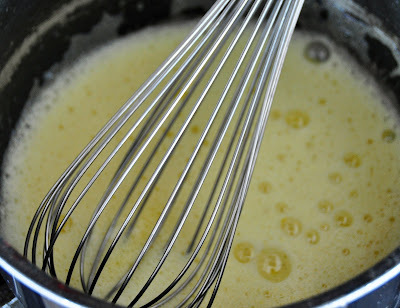 In a small heavy sauce pan, whisk egg yolks, sugar and 1/4 cup water. Whisk and stir over low heat until mixture reaches 160 degrees. It will take 4 to 5 minutes is all. This mixture is like a thin custard. Remove from the heat, and whisk into the cooled chocolate mixture. Sit saucepan in ice and stir occasionally or place in the Fridge until cool. Gently fold in Whipped Cream. 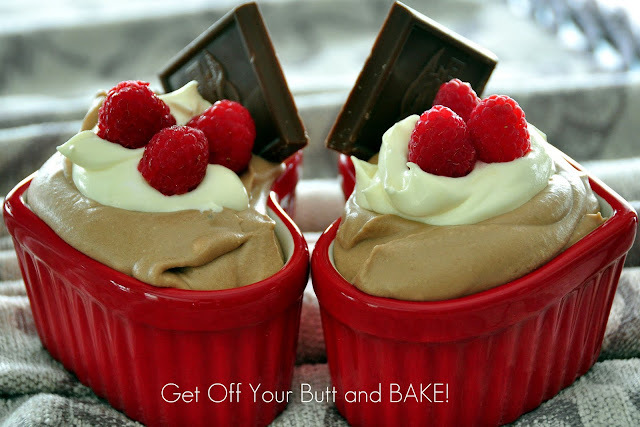 Spoon into dessert dishes. Refrigerate until set, about 1 hour or over night. *really good on top of Mousse. Mix above ingredients together with a Wire Whip. Set in fridge to Cool, for 15 to 20 minutes. This will set up and be quite firm. 2 1/2 cups of Cool Whip. Serve with fruit or use for Cream Puff filling or Eclairs. Keep in well sealed container in the fridge. This will keep for several days. Thanks for sharing this—-right when I needed it= for V-Day! Kathy this should be enough for 4 servings.